Sharknose Ferrari Grand Prix car. 1960s GP Ferrari 156 - friction drive plastic toy. 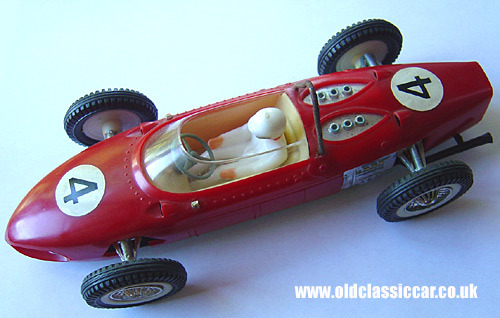 This red toy racing car measures approximately 8.5" in length, and is based on the 'sharknose' Ferrari Grand Prix car from the 1961/62 era of Grand Prix motor racing. Drivers of the real car in period include Phil Hill and Wolfgang Von Tripps, a driver who sadly lost his life at the wheel of such a car. Hill went on to win the 1961 championship in a 156. There are no markings to suggest who exactly made this plastic toy car, although it was made in Hong Kong sometime in the 1960s. It features a friction-drive motor, powering the rear wheels, and makes a half-decent noise too! The car also has working steering (although the steering wheel does not turn, so the car's direction has to be set directly with the front wheels). Car No.4 was the number on Hill's Ferrari so presumably that was the inspiration behind this toy.